Fenella Kernebone chats with Lighting Architect, Mark Major. Mark Major trained and practised as an architect prior to focusing on the unique relationship between light and architecture. He has worked on a wide range of award-winning international lighting projects including the Millennium Dome, Zollverein Kokerei, Beijing International Airport, and the re-lighting of the interior of St. Paul&apos;s Cathedral. He is currently the lighting master planner for the Barangaroo development in Sydney. 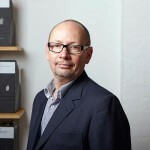 Mark is a specialist in the field of urban lighting and was named as part of Monocle&apos;s urban &apos;Dream Team&apos; in July 2013. He also acted as the Lighting Design Advisor to the Olympic Delivery Authority for London 2012 and was appointed to the Mayor of London&apos;s Special Assistance team for the Outer London Fund in the same year. With an active interest in architectural and lighting education Mark has lectured extensively in the UK, Europe, Scandinavia, US and Australia. He was the co-creator of an educational project &apos;Made of Light – the Art of Light and Architecture&apos;. Mark is a corporate member of the Royal Institute of British Architects and the International Association of Lighting Designers and a Fellow of the Royal Incorporation of Architects in Scotland. He was created a Royal Designer for Industry in 2012.